Oe Masamichi and Iai is a short excerpt that I have translated from 古流居合の本道_全解・無双直伝英信流 (剣道日本) Koryu Iai No Hondo, written by Norikazu Iwata Sensei and published in 2002. There are, as always a number of difficulties in translating from Japanese, (for more on that read - this article) and any and all errors are my own. Why does modern Iaido engage many people's hearts and minds? The reason is probably the allure of Japanese sword. If many of the Japanese have a chance to see high-quality Iai up close, they would be fascinated with the nifty swordplay, wonder if they could do it, and want to try it. Then, after they start learning and getting the hang of Iai including the order of how to draw and insert sword, and practice the same move over and over, they realize by degrees how difficult iaido is. In the course of time, even though the schools of Iai they encounter are different, they all come to immerse themselves in the deepness of the “Iaido” world which has been hewed by the forerunners, and its unbeheld/unseeable goal. Iaido, which is an unrelenting body and mind discipline, enriches the individual’s life as they become more trained and skilful over the years. I, who have been doing Kendo since I was a child, was attracted to Iai and became carried away with it day and night after the war in my middle age. That is because there was a depth of culture in unlimited Japanese sword skills. This applies not only to Muso Jikiden Eishin-ryu, but each kind of Iai school that we are studying now. These skills are all developed by our predecessors who adopted the use of Japanese swords. Knowing the history and base of the school that you are studying is one of the important points of Iai culture. Studying the old style means to accurately adopt skills that are passed down. That is completely different from copying forms. Even though forms look similar, that is not a real skill if you don’t surely slash your imaginary enemy. The rules of movement have genuine reasons. That is the value of the old style. The Muso Jikiden Eishin-ryu that I came in contact with is the master stream of modern Iai style. The arts originated in the Tosa area of Kochi prefecture in Shikoku, and it was an Iai sword technique which was generically called Tosa Eishin-ryu. Let’s review its history at the very beginning. The source of Iai was established by a swordman named Hayashizaki Jinsuke Shigenobu. He was a swordman during the Muromachi and Sengoku era, and he is said to be the originator of Iai. In Tosa, there was a seventh-generation heir, counting from Hayashizaki, called Hasegawa Chikaranosuke Eishin in Edo era. He improved Shigenobu’s art that had been passed down to him by adding Tatehiza karano Iai* and Tachi-Iai*, and it was greatly accepted. Thus, this style came to be called Hasegawa-ryu or Hasegawa Eishin-ryu. The person who added “Seiza no Iai*” to this Hasegawa Eishin-ryu is the nineth-generation heir Hayashi Rokudayu Morimasa from Tosa. 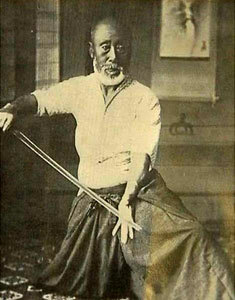 He learned “Seiza no Iai” from Ohmori Rokurozaemon Masamitsu who was a master of swordplay in Shinkage-ryu. Therefore, “Seiza no Iai” was called Ohmori-ryu, (my note - we currently spell this Omori, however I'll keep the to the exact translation as I have with other spellings) and it was handed down to future generations along with Hasegawa Eishin-ryu. It is considered that Hasegawa Eishin-ryu Iai including Ohmori-ryu was deep-rooted to Tosa’s liege Yamauchi-family around this Hayashi Rokudayu’s time. Hasegawa Eishin-ryu Iai became to be called Tosa Eishin-ryu after the area of it's location. Back in these days, it wasn't like today’s organized Iai, and it seems like different skills and styles existed. Among Tosa’s martial arts, Iai dominated high position. Iai was treated as an independent Budo, and it was never an easy matter to be certificated and master Iai, hence each master taught their skills to only one person. Past masters emerged one after another in that kind of environment. Tosa Eishin-ryu started to be called Tanimura-ha and Shimomura-ha separately from its 12th-generation due to different understandings of skills and drawing styles. Still, Iai was increasingly popular in Tosa, and it was called either Eishin-ryu of Tosa or Tosa of Eishin-ryu. Under the prodding of Itagaki, Tosa’s Eishin-ryu came back to life again. At the end of Meiji era, Nakayama Hakudo visited Kochi from Tokyo to learn its skills. This is because of Itagaki’s contribution as well. Nakayama Hakudo especially learned Shimomura-ha, and introduced Tosa Eishin-ryu Iai’s existence throughout the nation. Then he established Muso Shinden-ryu later. This is the style which has the most disciplinants in today’s Iaido world. When the Samurai period ended and swords became no use, a man worked on the Tosa Eishin-ryu skills that are carried down in Kochi, and took an important part in handing it down to next generation from the end of Meiji to Taisho era. That is Tanimura-ha’s 18th-generation heir, Ohe Masaji (Oe Masamichi). Ohe organized the skills of Tosa Eishin-ryu, and established Muso Jikiden Eishin-ryu. In the first place, the traditional Iai sword method was only taught on a one-to-one basis. What is more, it was a quite difficult martial art, that ordinary people couldn't master. A Kendo teacher and Dai Nippon Butokukai’s (Greater Japan Martial Virtue Society’s) Kochi branch director, Ohe Masaji made innovative changes to that. Instead of rearranging it by adding his originality and making his own style, he assembled traditional arts in order like a textbook, and named each one of the skills so it is easier for people to understand. You've been reading an excerpt of my translation of Koryu Iai No Hondo, written by Norikazu Iwata Sensei on Oe Masamichi and Iai. Check some of my other translations - here.